In Florida residential real property transactions, home sellers are required to disclose to a prospective buyer all known facts about the property that might materially affect its value. This requirement has been around since Johnson v. Davis, 480 So. 2d 625 (Fla. 1985), when the Florida Supreme Court announced a new rule of law to replace the long-standing rule of "caveat emptor," when dealing with residential real estate transactions. Simply put, sellers cannot lie to buyers about the condition of a property. They cannot hide known issues and in fact must report to buyers anything that they know regarding the property if it could impact the present or future value of the property. This relates to not only the physical condition of the property, but also to anything going on locally or in the neighborhood that might negatively impact property values. Unfortunately, not everybody wants to play by the rules, so I have a few tips that you should consider when you get serious about buying a home in Florida. In Tallahassee, REALTORS use a standard form entitled Sellers Property Disclosure Statement (SPD) as a means to assist the seller in providing the required disclosure information to prospective buyers. 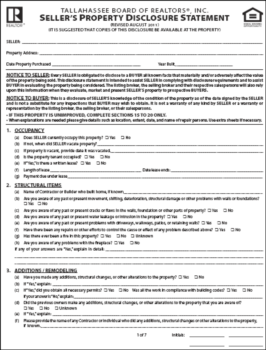 We then attach this disclosure form with any other documents related to the property in question in the Tallahassee MLS so that Realtors have easy access to them at any time should they have an interested buyer. Not all listings in the Tallahassee MLS include the SPD, and it is usually just an oversight by the listing agent on the property. You should always request to see this document when you are preparing to make an offer. If you find a property that you like and the listing agent has not provided the disclosure, simply insure that you include language that requires the disclosure be delivered with the return of your offer (at the time of contract). IMPORTANT - Require the seller to re-date and sign the SPD at the time of contract. If the home has been on the market for a while, it is likely they have had some work done preparing it for the sale. All of that work should be disclosed before you begin ordering inspections. Most sellers and many real estate agents do not understand the importance of the Seller's Property Disclosure Form so they rapidly fill it out when they first list the home for sale. The house might sit on the market for months (or even years) without the SPD ever being updated, so requiring them to bring it current is a very polite way to tell the seller that you plan on holding them accountable for the veracity of the information in the disclosure. If they are hiding information about the condition of the property (typically roofs, plumbing and HVAC systems), then this newly updated SPD will be the evidence that you provide your attorney if you end up wanting to terminate the Agreement to Purchase based upon property conditions that should have been previously disclosed to you. Nothing will anger you more than spending money on a property inspection only to find conditions that were already known but not disclosed by the seller. This happened recently to one of our buyers, when the property inspector found a towel, cardboard, and some plastic bags that had been rigged to stop a roof leak. But if you looked at the SPD that the listing agent provided in the MLS, the "NO" box was checked next to the disclosure question "Has the roof ever leaked during your ownership?" Considering this twelve year old home has had no other owners, it does not leave much reason to be optimistic about the owner's integrity. While there is no way to stop a home seller from purposely hiding property defects from you, you can certainly put them in a position to pay when you discover their fraudulent actions. Just remember to take the necessary step of requiring an updated Sellers Property Disclosure when you buy your next home.